These three battery rests are EIN  and are marked: E.S.B. CO. // PHILA, PA. The left one has some small olive streaks, but that annoying blob in the inner 'skirt' is an old ID tag from its previous owner. It shows it was purchased in 1976, and I bought it in 2008. 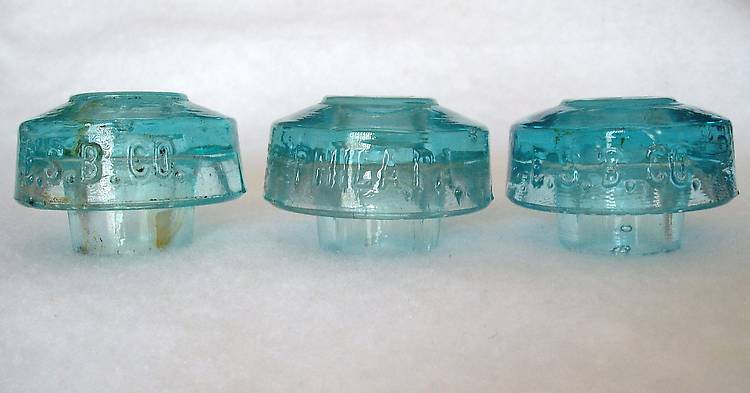 While these are 'just aquas', all three are different tones, and show up better in indirect light. The right one being the one with the most depth of blue aqua color.